A staple for all food eaters (Gus). 3. Heat up the oil in your wok and add the onions. Immediately, add the 2 tbsp curry paste and saute until aromatic. 4. Add the chicken and stir well with the curry paste. Shortly after, add the garlic using a garlic press. 5. Add the whole can of coconut milk, the water, and the fish sauce. 6. Start adding the vegetables in order of how long they need cooking. First carrots, then snow peas a few minute after. Bring to a boil and cook with the lid on. 7. Adjust seasoning: salt, pepper, maybe a little lemon juice if it needs it (it usually does). Add some cilantro if you have it. 8. Once it's all cooked, scoop the rice and serve with mango chutney. Editors Note: In a Thai restaurant in LA recently with the fam., we had to pass through the kitchen to wash up. 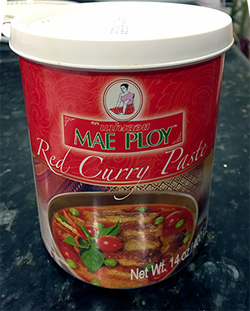 The kitchen was STACKED with boxes of Mae Ploy - must be authentic!